Latest cruise statistics for Australia, just revealed, are awesome – but there’s a note of caution amid the cruise industry’s understandable exuberance. As Carnival Australia executive chairman Ann Sherry puts it, “future strong growth and economic performance can be sustained only if port infrastructure challenges particularly in Sydney are addressed”. Sydney is Australia’s prime magnet for international cruise passengers and the city badly needs more port space east of Sydney Harbour Bridge. Latest figures leave no doubt about the current cruising boom or the amazing potential. According to new cruise industry statistics, an additional 222,378 Australians cruised last year, taking the number of Australian ocean cruise passengers to an unprecedented 1,281,159 in 2016. Australia’s largest cruise operator Carnival Australia says the growth in cruising on its locally-based ships has helped fuel a 21% increase in the number of Australians taking an ocean cruise. Nearly 80% of the additional 222,378 Australians who cruised in 2016 sailed on ships from Carnival Australia’s seven iconic brands: P&O Cruises, Princess Cruises, Carnival Cruise Line, Cunard, Holland America Line, Seabourn and P&O Cruises World Cruising. Helping to drive the growth was a massive increase in P&O Cruises’ local capacity, with the addition of Pacific Aria and Pacific Eden in November 2015, as well as a strong focus on South Pacific cruising from Carnival Cruise Line and P&O Cruises, and Princess Cruises’ leadership in the New Zealand market. Reflecting Carnival Australia’s industry leadership, the 2016 Cruise Line International Association (CLIA) Australasia Australian source market report shows that the number of Australians cruising close to home on itineraries visiting Australia, New Zealand and the South Pacific surged to almost one million cruisers in 2016. This equates to 76.7% of all Australian passengers, up from 71.3% in 2015. 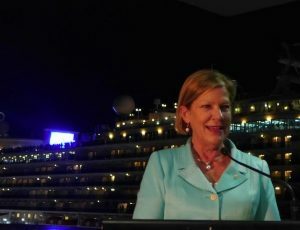 Carnival Australia Executive Chairman Ann Sherry said that seven out of ten of the 1,281,159 Australians who cruised in 2016 sailed on ships operated by Carnival Australia brands. “We are very proud of Carnival Australia’s part in cruising consolidating its position as the most successful sector of Australian tourism with more than a decade of double digit annual growth in passenger numbers,” Sherry said. Meanwhile, 9 out of 10 Australians who sailed on world cruises did so with Carnival Australia brands Princess Cruises, Cunard and P&O Cruises World Cruising. “The CLIA report shows that 2016 was another stellar year for cruising and a solid foundation for its economic contribution in excess of $5 billion this year supporting more than 20,000 jobs,” Sherry said.